A Kodak circular snapshot photograph of Kingsbury and Neasden station, taken by an unknown photographer, c. 1890. Kingsbury and Neasden station opened in 1880 as part of the extension of the Metropolitan Railway - the first underground railway to be built in London. Although the Metropolitan Line still runs through the station, it is now only served by the Jubilee Line. 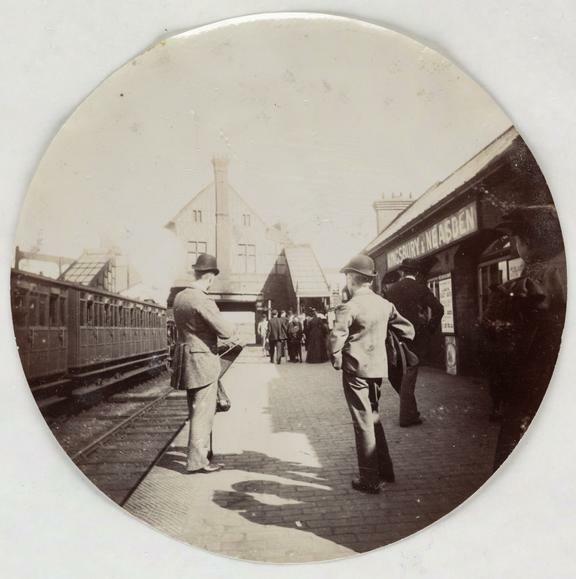 A Kodak circular snapshot photograph of Kingsbury and Neasden station, taken by an unknown photographer, c. 1890.